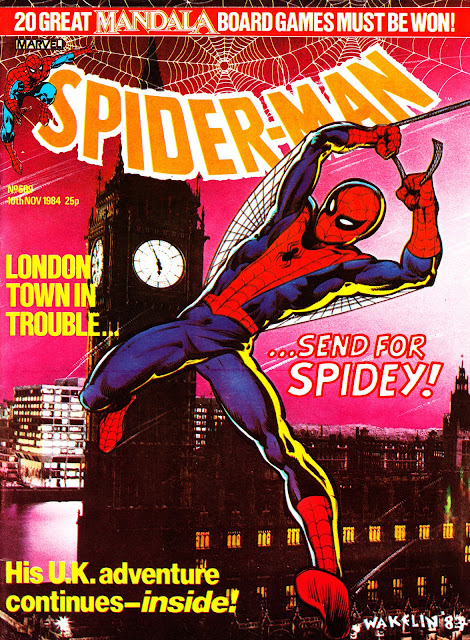 Rumour has it that the next Spider-man movie will be called THE AMAZING SPIDER-MAN: LONDON CALLING (hurrah for the BBC World Service) which -if true - is very intriguing and opens up a world of possibilities. 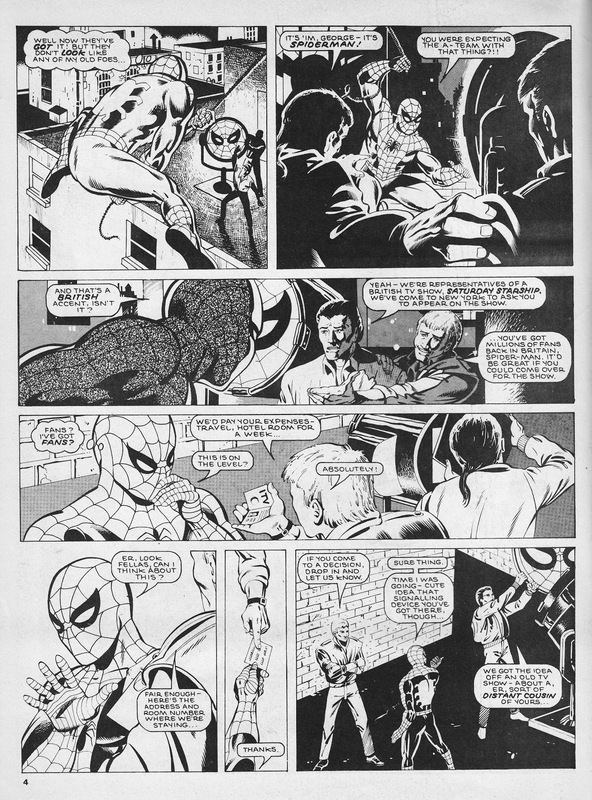 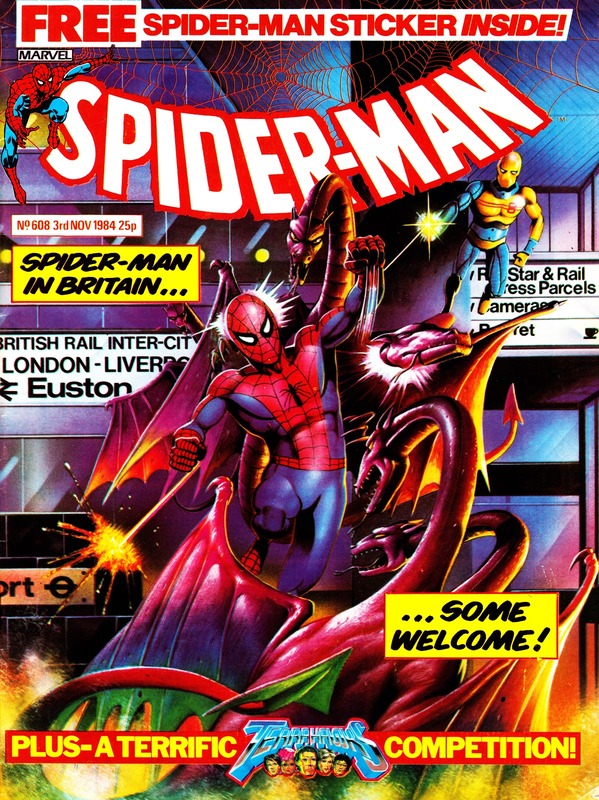 Which gives me the excuse I needed to run these pages from Spidey's exclusive 1984 visit to London... and Birmingham. Back in 1984, Marvel UK management faced a dilemma: should they introduce Spider-man's controversial black costume? Sales of the weekly were already on-the-slide and they feared an unfamiliar look would confuse and alienate casual fans, as well as merchandisers looking to acquire the rights to the character (a lucrative sideline for the Annex of Ideas). 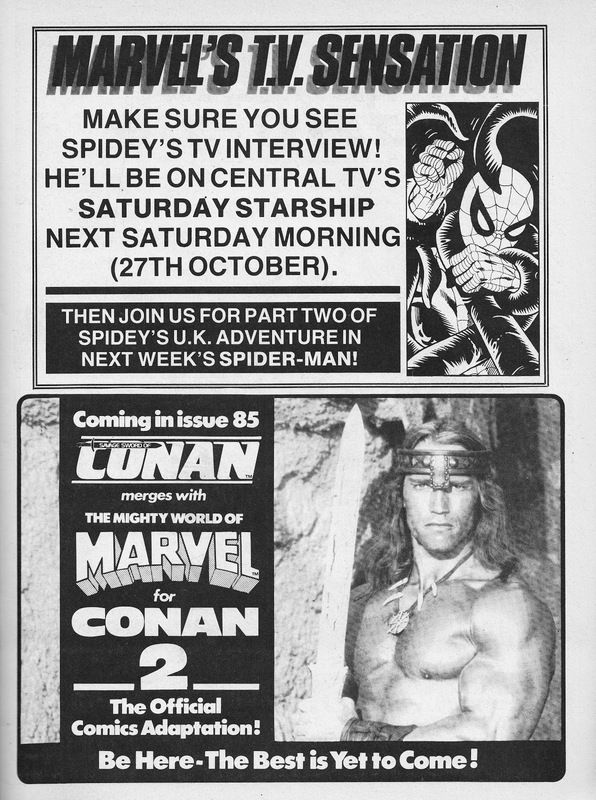 The original plan was - apparently - to cease reprints of the US strips in favour of all-new British-produced adventures. These would have also - presumably - have been offered to other international publishers of Marvel strips with similar concerns. 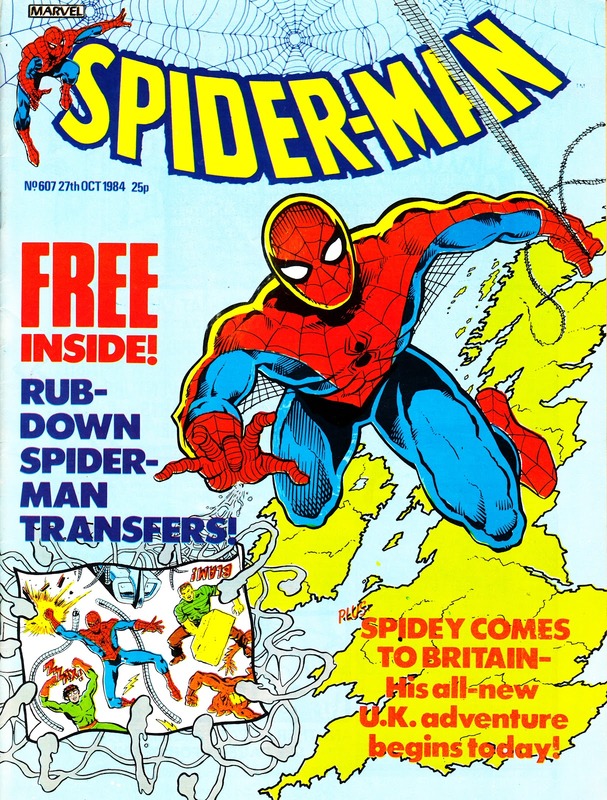 After some delay (apparently Marvel US had to be convinced that their principle character could be entrusted to the UK operation), the plans for a regular run were truncated to a four-part try-out, running in issues 607-610. Marvel were canny enough to peg the strip to a personal appearance of Spidey (aka a bloke in a costume) on ITV's live networked Saturday mornings kids show SATURDAY STARSHIP, produced by Central Independent Television from their Birmingham studios. Ironically, the same morning, the BBC repeated an episode of SPIDER-MAN AND HIS AMAZING FRIENDS as part of their Saturday morning kids offering. 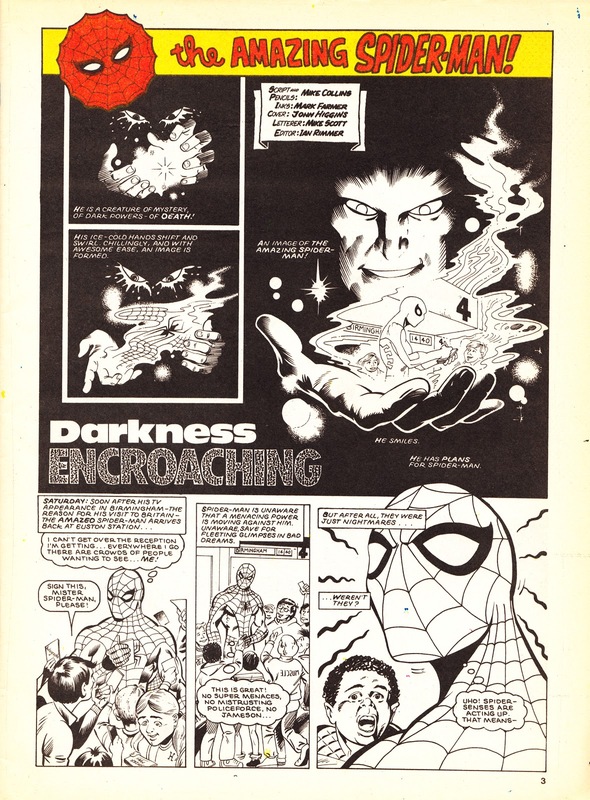 By this point in the weekly's long and convoluted history, it had adopted a format which ran alternate double-page spreads of colour and black & white art (giving the effect of watching a TV on the blink). The UK-produced strips appeared in black & white throughout with only the splash pages given the colour treatment. Issues 607 and 608 were also accompanied by loosely-inserted free gifts: transfers and a sticker. 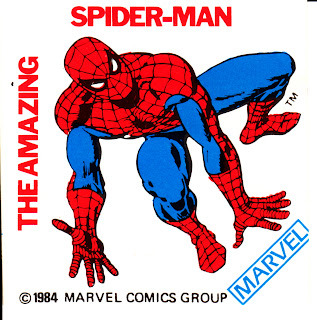 Presumably deemed a failure (although the strips themselves are perfectly serviceable), the experiment was never repeated and the weekly went into a quick decline through 1985. 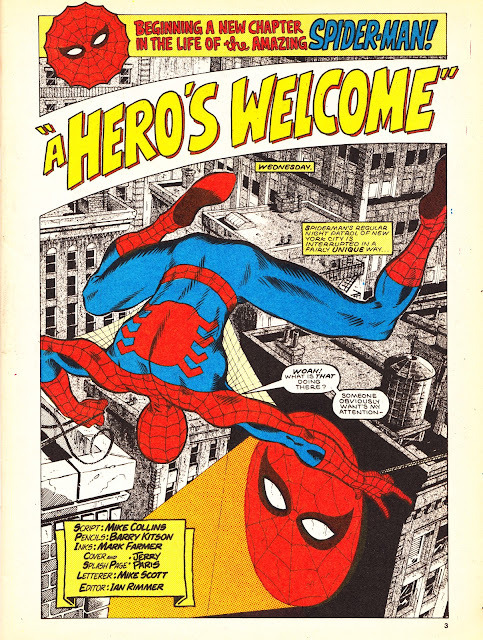 The page count was cut (albeit with glossy paper added), the main strip switched to older (out-of-continuity) reprints, production standards dropped and - from issue 634 - relaunched as THE SPIDER-MAN COMIC, pitched at a younger audience. 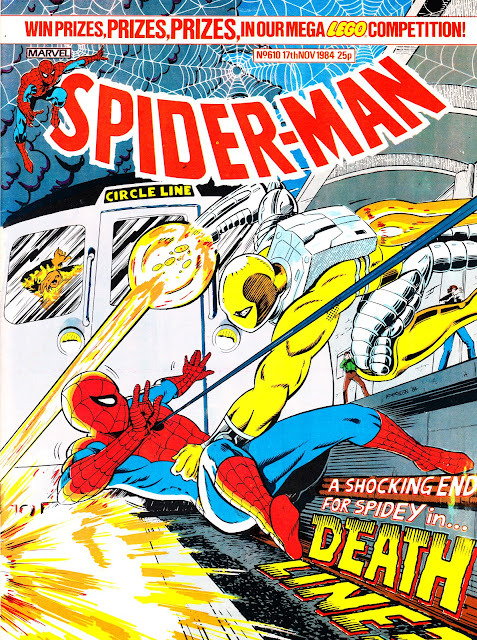 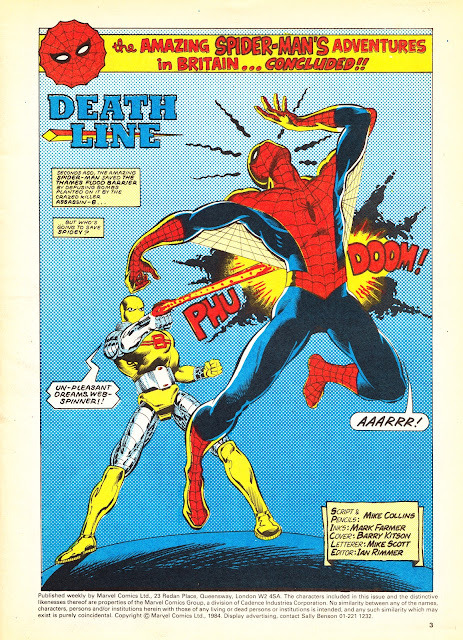 A further name-change -SPIDEY COMIC - followed from issue 651 and it was cancelled with issue 666, cover-dated 14 December 1985. This adventure has never been reprinted on either side of the Atlantic. Spidey staged another TV-related transatlantic trip to the UK during 1985. 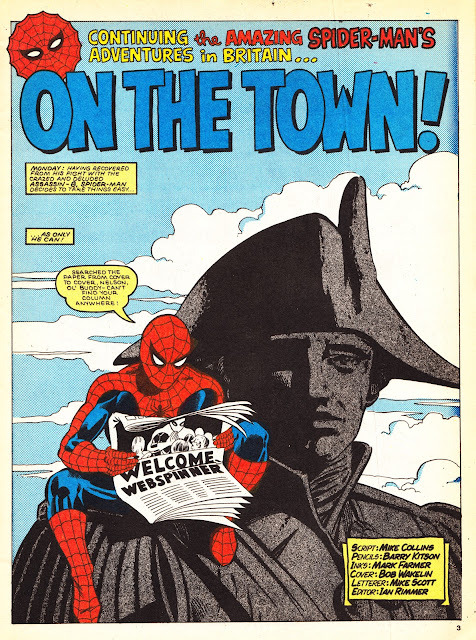 You can read that adventure here. 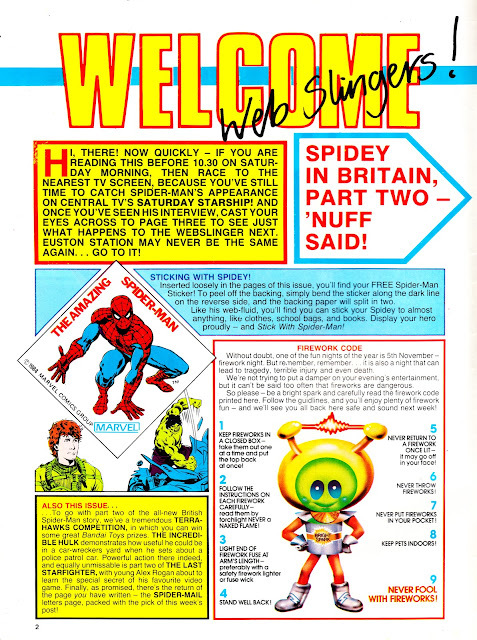 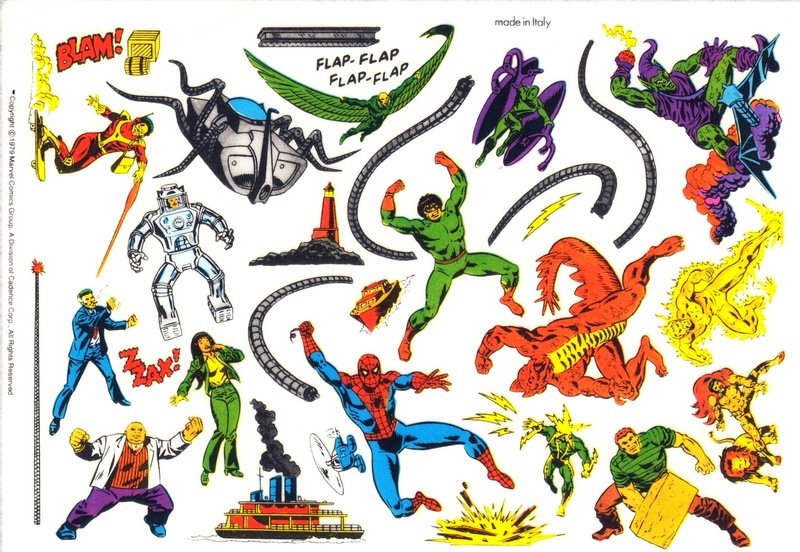 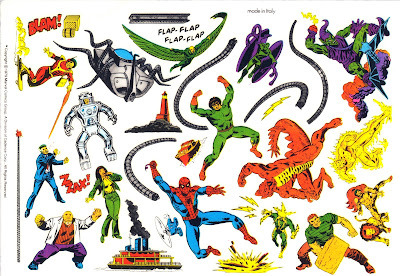 Details of Spidey's appearance on ITV's SATURDAY STARSHIP.